Scamp Theatre are responsible for bringing Julia Donaldson and Axel Scheffler's delightful book, 'Stick Man' to life, and it is back at The Lowry in time for the festive season. 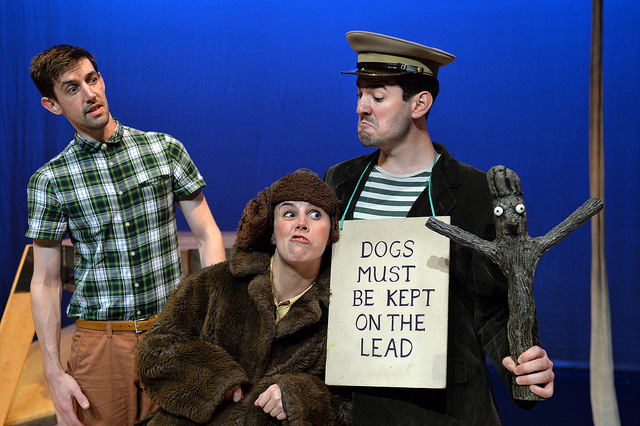 We are huge fans of Julia Donaldson’s books and we love family theatre. So when The Lowry invited us to a showing, we decided it would be a lovely way to spend a rainy morning this December. The story is about Stick Man and his adoring family of Stick Lady and three little Stick Children. After going for a jog one morning, Stick Man encounters a bounding dog, who just wants to play fetch with what he thinks is just an ordinary stick. This sparks a series of unfortunate adventures, which lead poor Stick Man far away from his home in the Family Tree. Time goes by, and just when Stick Man has abandoned all hope of ever seeing his family again, along comes Father Christmas to save the day. Stick Man is re-united with his family just in time to celebrate Christmas with them. 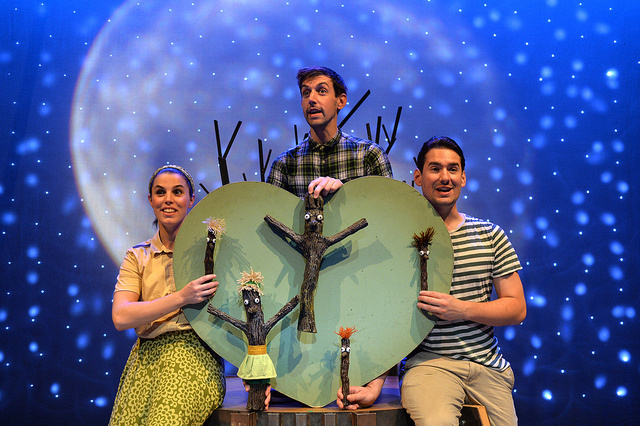 Stick Man is brought to life by a trio of extremely talented actors, who between them, portray a myriad of characters including the ones Stick Man encounters on his adventures. They sing, dance and treat us to some delightful live music. They manage the prop changes with effortless ease and discreetly change costumes to flit between characters. What makes Stick Man even more enjoyable during the festive season is the not-so-subtle references to a traditional pantomime show. Like when the actors encourage the audience to scream, “Behind you!” in response to a question. There is plenty more audience engagement, like a game of beach ball when Stick Man accidentally ends up on the beach. And there a few jokes and gags scattered throughout aimed specifically at the grown-ups in the crowd. So really, there is something for everyone in Stick Man. With a running time of 60 minutes, Stick Man is absolutely perfect for young children and their families to enjoy together. 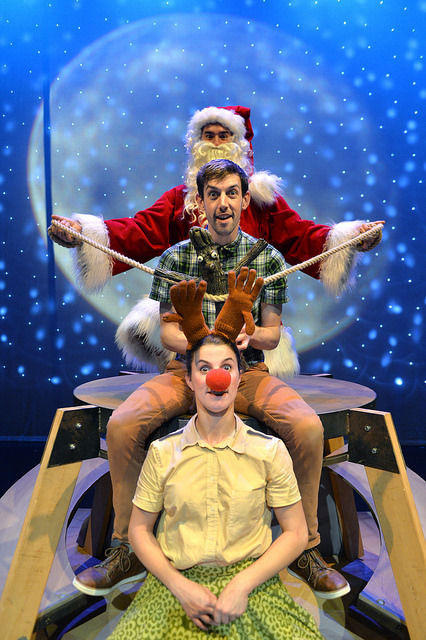 Shows at The Lowry continue all through December and into the New Year, and are proving to be extremely popular. So make sure you book your tickets and not miss out. Disclosure: We were invited to attend a performance of Stick Man in exchange for this review. All opinions are my own. All photos copyright The Lowry. 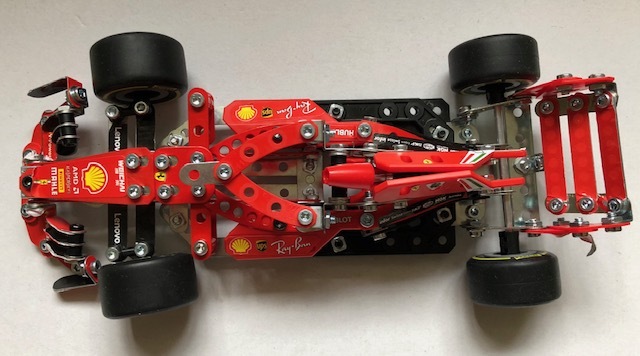 The Meccano Ferrari Grand Prix Racer Car is a great piece of kit, not just for Meccano fans but also for anyone who enjoys racing cars or Ferrari as a brand. 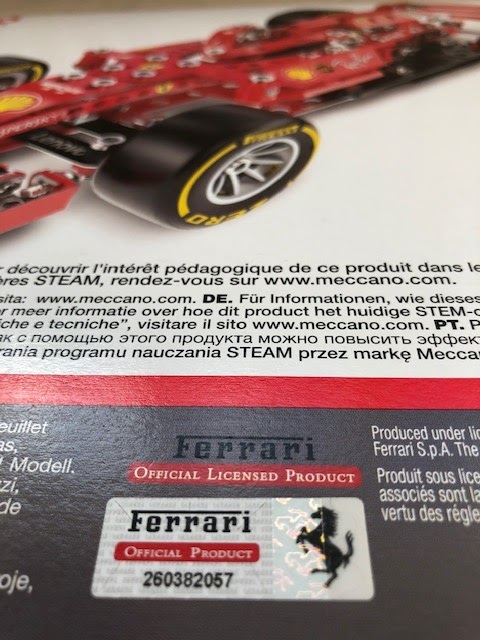 It does have an endorsement of authenticity from Ferrari, after all. 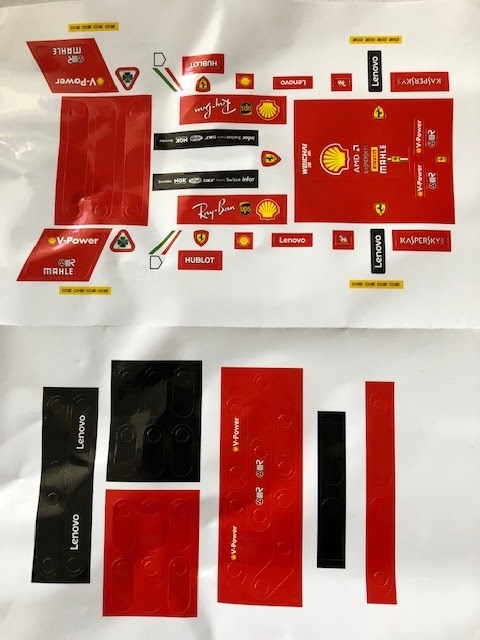 The kit comes with 325 parts, 2 tools, 1 sticker sheet and 1 instruction sheet. It is recommended for experienced builders aged 10+ and has an estimated construction time of 1- 3 hours. We love defying recommendations, possibly just as much as we love a challenge. 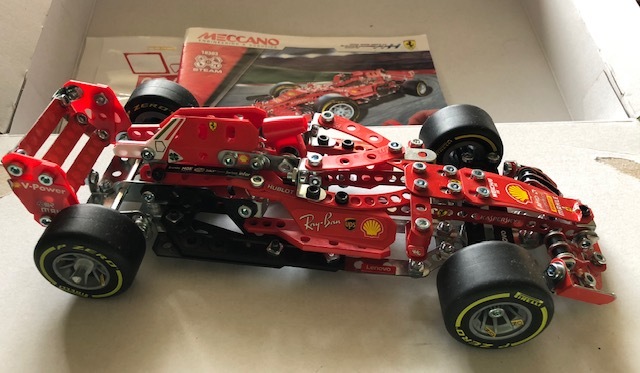 The Meccano Ferrari is one that we warmed to immediately. J is nearly 8, and has a penchant for building and construction. He enjoys taking things apart and loves trying to piece them together. He also loves making his own models, using paper and other bits and bobs from his craft box. 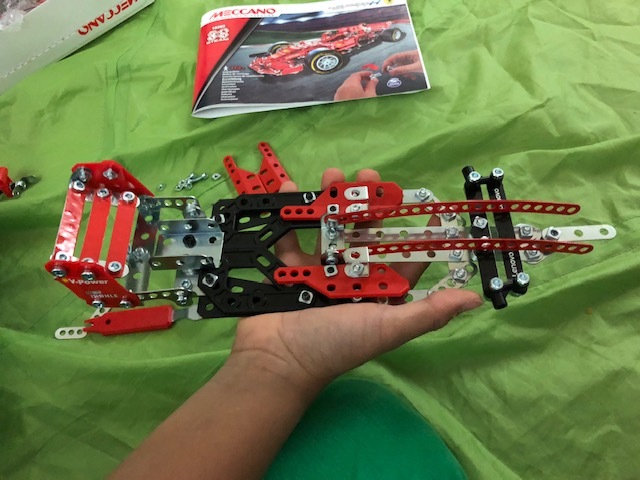 Last year, he built the Meccano Max with help from Daddy M. This year, he decided he wanted to have a go building this Meccano Ferrari Grand Prix Racer Car all on his own. He is, after all, a year older and infinitely more self-assured! His logic was that this set would be easier than Max as there are no electrical circuits involved in the build. J set about bringing this Ferrari to life, one step at a time. He spent hours on this build. He worked on it in the mornings before school and then again for a little while in the evenings, one little piece at a time. 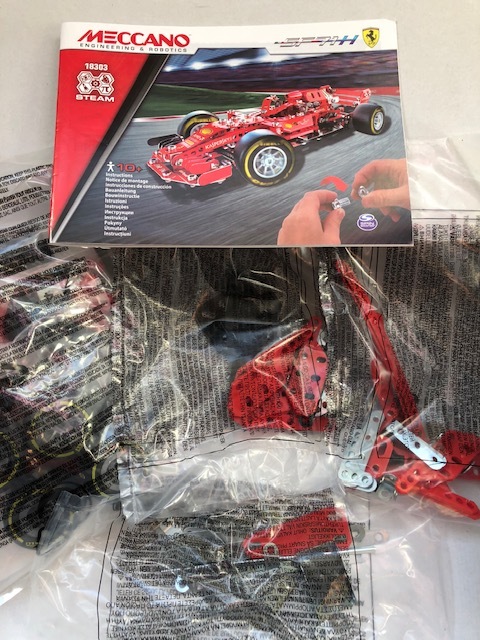 He needed my help with step 24, and he needed M to intervene towards the end when tightening some of the parts became really tricky due to sharp angles and tight spaces. Other than that, this was entirely J’s project. He looked at the diagrams, picked up the recommended parts and checked them to make sure they were the correct shape and size. He aligned strips of metal and held them together with a nut and bolt, his clever fingers deftly working the screwdriver and spanner to secure them in place. 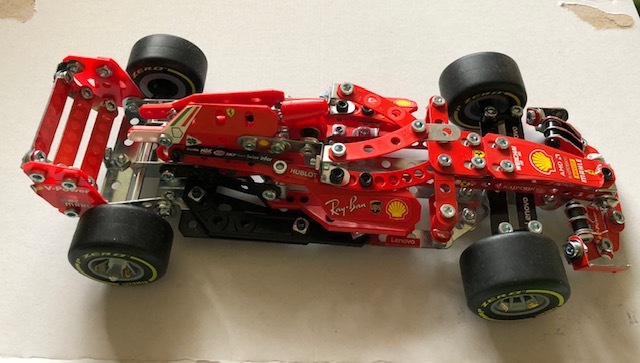 Meticulously and painstakingly, my nearly 8 year old pieced together this Meccano Ferrari over 15 days. So yes, it is a moderately difficult build and yes, it does take much longer than 3 hours. And no, our end result does not look anywhere near as neat and tidy as the picture on the box. But it has been done by a determined nearly-8 year old. And of that, I am proud. 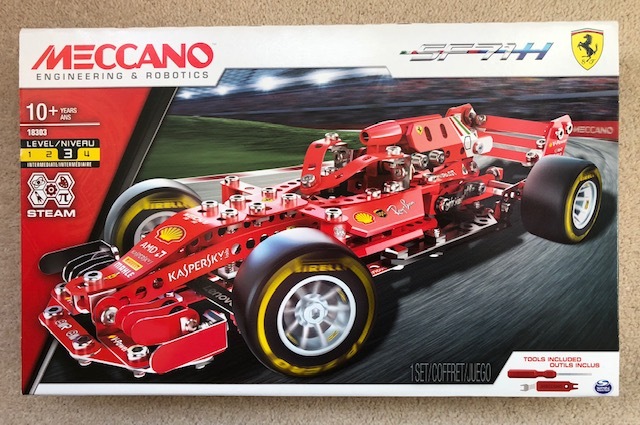 “I want to be an engineer and work for Meccano!” J proudly declared as he held aloft his model Ferrari. 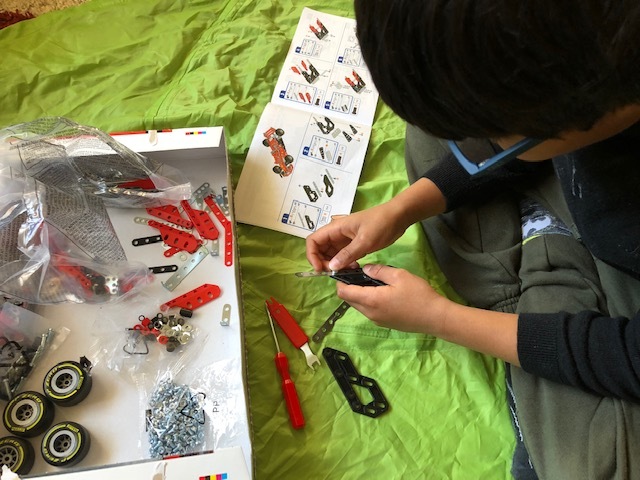 The kit has not only helped my son work on his dexterity and STEAM skills, it has taught him important lessons in patience and perseverance. Disclosure: We were sent this set for the purpose of this review. All opinions are my own. Time is a concept alien to most children! At 7 years old, my son is no different. He does not understand the importance of being on time or what it means to be wasting time. For him, as with most children his age, time is endless. It has no beginning and no end. It sadly falls to me as his parent to teach him that time is not limitless. There are 24 hours in a day, 60 minutes to the hour and 60 seconds in every minute. A visual reminder is always good to reinforce a new concept. 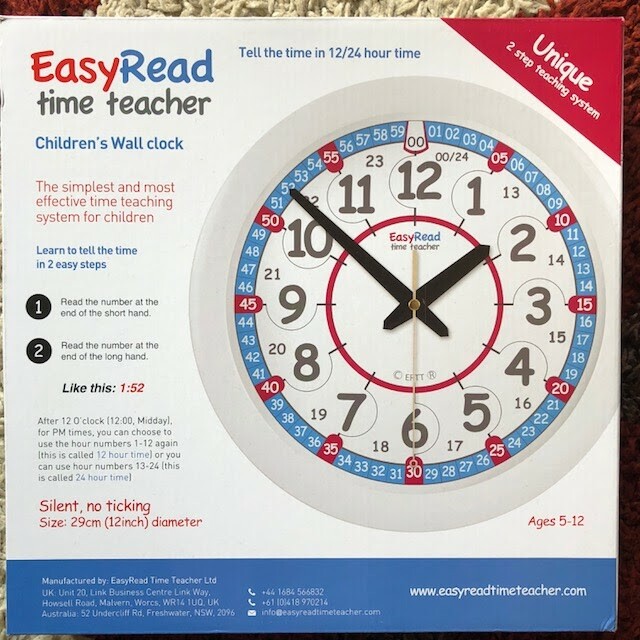 Something like the EasyRead Time Teacher 24-Hour Wall Clock, with its striking bright red and blue colours, is likely to get J interested in telling the time and keeping track of it.